The Asphalt series has quickly evolved over the last few years. From it’s humble beginnings on the Nintendo DS, to its first release on the iPhone with Asphalt 4, each version has seen new features and various tweaks that improve the gameplay. This latest iteration is no different. This is an arcade racer at heart, which contrasts well with other racing sims in the App Store such as Real Racing. 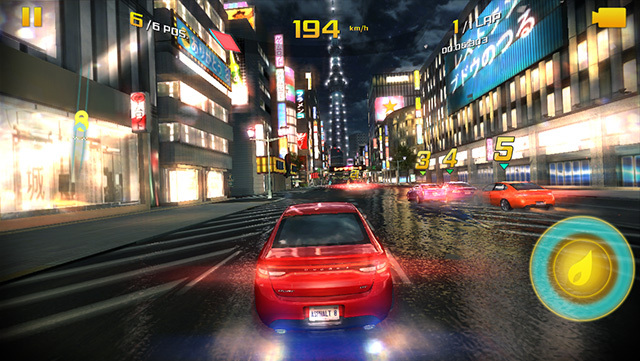 The game rewards the player with both points and a speed boost that can be increased by narrowly missing on-coming traffic, performing aerial stunts and smashing into opponent cars. The tracks are littered with obstacles, including bollards, windows, bridges and ramps, making each race a frantic experience. Early races are easy to win, making the introduction to the game both satisfying and addictive. Further cars are unlocked by spending in-game points, so to proceed into the latter stages it’s necessary to either win multiple races in pole position or spend real money on in-app purchases to give yourself an advantage. The game never feels like it’s forcing you into buying additional credits, however. The game automatically takes care of acceleration. 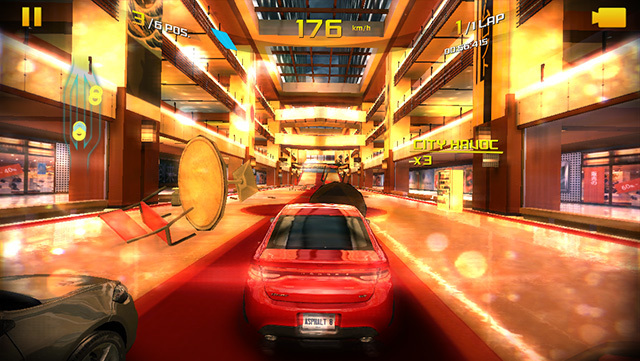 Tapping on the left-side of the screen breaks or slides the car around corners, whereby tapping on the right triggers a boost that can be used to propel the car past opponents or off ramps that litter the track. It’s standard fare for an iOS racer, and perfectly suited for touch screen input. One word describes the visuals in Asphalt 8: gorgeous. The title is packed with advanced graphical features including soft shadows, reflected surfaces and particle effects. The texture work is detailed and rich, with landscapes and cities that appear to pop off the screen. There’s no sign of pop-up, even on long stretches of track, making it easy to line up for corners or up-coming ramps. The car models are fantastic. From Audi’s to Mini’s, they’re all instantly recognizable and fun to drive. It’s also nice to see Tesla Model S included in the line-up. However, there is a slight stutter to the game, even on an iPhone 5. It’s not enough to impact playability, but it might annoy those looking for a silky smooth 60 frames-per-second. Gameloft has knocked it out of the park. 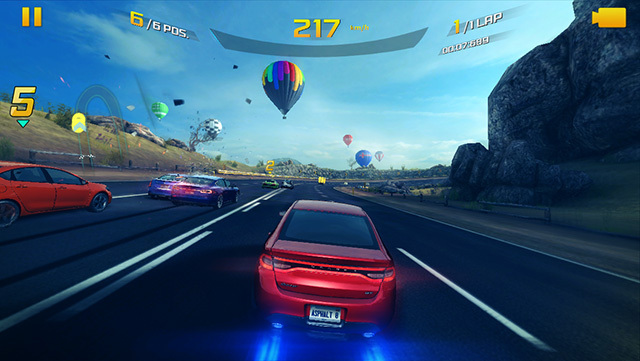 Asphalt 8: Airborne is easily on-par with console-quality games such as Need for Speed and Ridge Racer, with sublime graphics, robust multiplayer and bags of content. It’s also a bargain — even with in-app purchasing.